A dinner going horribly wrong. This past year, Hollywood lost two of its greats, Robin Williams and Mike Nichols. Now I have finally seen the latter direct the former in 1996’s The Birdcage, which is a remake of the French play La Cage aux Folles. 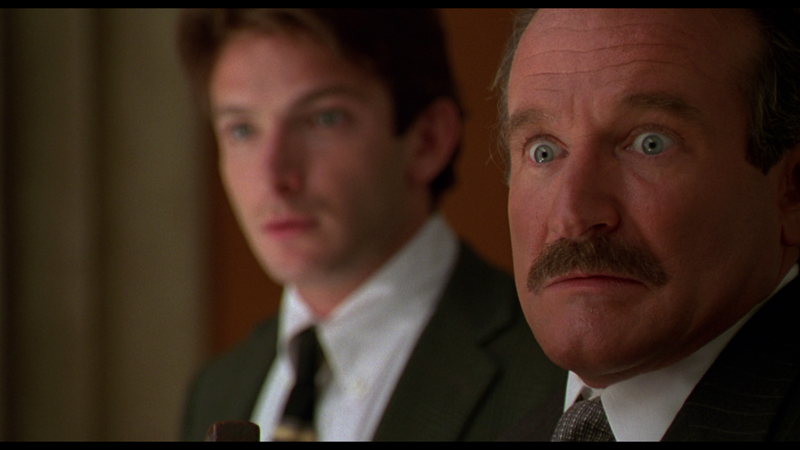 Robin Williams portrays Armand Goldman, the proprietor of the titular nightclub. He is also in a relationship with the starring drag queen Albert (Nathan Lane). Armand finds he has to put on the ultimate show to impress his son’s fiancee’s parents, one of whom is ultra conservative Senator Kevin Keeley (Gene Hackman). I went into this movie having seen The Graduate, which was the movie that made Mike Nichols a household name to many. Naturally, the Nichols’ style evolved in the 30 years that transpired between the two movies. The central conflict of the movie surrounds Armand’s and Albert’s homosexual relationship. While this movie is almost 20 years old, there are elements that are simultaneously timeless and dated. On one hand, we see Senator Keeley spouting the names of exactly the same Fox News right wingers we’re used to hearing today while advocating a return to traditional, white Christian values. On the other, we have Nathan Lane’s portrayal of Albert. While I thought he was extremely funny, he was simultaneously pretty much every offensive stereotype people used to have about gay men. It must have been all kinds of awkward for Nathan Lane, who actually is gay. I cite Nostalgia Critic in his review of the remake of The Haunting when I say writers in the 90s didn’t seem to know how to write gay characters without making them offensively obvious. Despite that, everyone involved with the movie really brought their A-game. Gene Hackman was great as always; I’m happy knowing his career survived the catastrophe that was 1987’s Superman IV. I also saw what is probably my new favorite Robin Williams moment. That was the only real moment of visual humor as the rest of the movie relied on very tightly-written dialogue. I couldn’t imagine anyone besides Williams, Lane, or Hackman delivering what the movie offered. Overall, this movie is absolutely worth seeing. You just have to get past Nathan Lane’s portrayal of a gay man, which is an unfortunate product of the movie’s times.